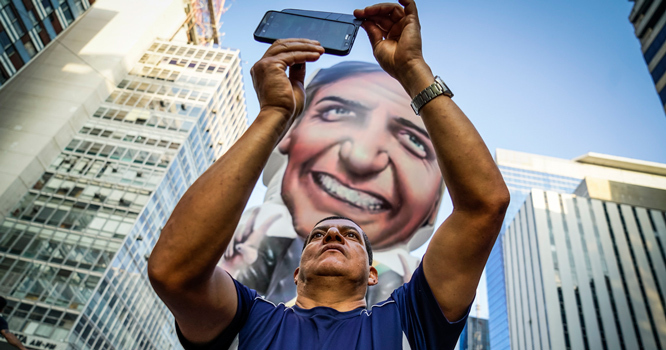 The fascistic Jair Bolsonaro nearly scraped a first-round victory in Brazil, an ominous sign both for the left and for the country’s democracy. But the values he espouses go far beyond Brazil, and it is up to the left to devise new alternatives. This piece appears as a collaboration between Nueva Sociedad, NACLA, and Dissent, in an inaugural effort to disseminate progressive viewpoints from across the hemisphere. Yes, as one correspondent wrote, the winner of last week’s elections in Brazil is an authoritarian, racist, machista, and homophobe, someone who embodies society’s most retrograde values. He scored more votes than polls predicted, snatched victory in the first round, and blanketed nearly the entire country except the northeast with his party’s colors. Brazil and Latin America thus face a new landscape marked not only by the end of a progressive cycle and its eventual replacement by right-wing or center-right forces within a democratic framework, but rather by an altogether different terrain: the potential second-round victory of a candidate who, by way of a campaign replete with bibles and bullets, openly defends dictatorship, boasts about violence, and rejects every foundational value of a democratic system. He is more than “another Trump”; he is a fascistic candidate in a country with far less institutional strength than the United States, a country already living through high levels of political violence. The October 7 vote extended the so-called BBB parliamentary bloc (Beef, Bible, Bullets—an allusion to the landed elites, evangelical pastors, and ex-security force personnel who comprise it) to an unprecedented scale. As a writer for Spanish newspaper El País notes, the “B” in Bolsonaro ended up grouping them all—and bringing them to the doorstep of power. to the construction of hostility towards the Workers’ Party (PT) and towards the left in general. This hostility is reminiscent of the anti-communism of the Cold War: conspiracy theory, demonization, moral failures, and a reprehensible political project. Bolsonaro appropriated this generalized rejection, exacerbated by instances of PT corruption. This is more than a move by conservatives to the extreme right, it is the consolidation of a rupture. As historian Zeev Sternhell has warned, fascism was more than merely reaction; it was viewed as a revolution of sorts, a will to change amid a state of crisis. It is impossible, from the standpoint of progressivism, to elide “Pink Tide” governments’ responsibility. That so many people are willing to vote for Bolsonaro to prevent the return of the PT is in itself a call to reflection, more so when these votes are centered in Brazil’s most “modern” areas, the birthplace of a party that seduced all of Latin America and that began losing support years ago. One indicator of this rejection: Dilma Rousseff, belying all pre-election surveys, failed to win a senate seat in Minas Gerais. And the PT did much to weaken its origin myths, its moral integrity, and its legacy. But there is more to this rejection. As I have noted elsewhere, the PT’s “soft” class war, which improved workers’ lives without taking from those at the top, nevertheless still proved intolerable for elites. The Brazilian case confirms that dominant classes only accept reforms under pain of “revolution,” and the PT in power in no way ushered social radicalization; and yet, in a country long marked by inequality, it promoted policies in favor of those “from below.” In any case, the PT experience ended up being characterized by too-cozy relationships between the government and an opaque “national bourgeoisie” (like meatpacking and construction companies) that undermined its project to reform political ethics and ultimately weakened the morale of its militants. In other words, the current rejection of progressive parties once in power is twofold. Throughout Latin America, a new right is consolidating around opposition to the left’s successes as much as its failures: racism in the face of a racialized vision of poverty, and conservatism against advances by feminism and sexual minorities. The rise of political evangelism and the popularity of politicians and opinion leaders who have declared war on what they call “gender ideology” are some of the vectors of an increasingly virulent anti-progressivism. “We are at war, we are on the offensive. No longer on the defensive. The Church has long been stuck in a cave waiting to see what the enemy is doing, but today it is on the offensive, understanding that it is time to conquer territory, time to take up places in government, education, and the economy,” proclaimed evangelical pastor Ronny Chaves Jr. at the World Worship Center (Centro Mundial de Adoración) during Costa Rica’s presidential campaign, where an evangelical candidate advanced to the second round last April. It must also be said that Dilma Rousseff allied with evangelicals during her presidency, but now many of these churches, such as the Universal, seem to be “going for it all” without the need for pragmatic alliances with the left. Moreover, the new extreme right also attracts a portion of the youth vote and has built up leaders with a strong social media presence. These movements portray themselves as anti-elitist, even while—as is the case with Bolsonaro—their economic proposals are ultraliberal and enthusiastically supported, ultimately, by markets. As the historian Martín Bergel has pointed out, a framing that links the left with “privileges” for certain groups, including the poor who receive social services, in contrast to people who “really work and receive nothing,” has proven quite effective. Region-wide progressivism is thus facing a deep crisis—political, intellectual, and moral. Venezuela’s catastrophic situation—to say nothing of the Venezuelan government’s silence in the face of paramilitary violence in Nicaragua—has greatly benefitted the continental right. In this context, Bernie Sanders’s recent call to establish a new progressive International—anchored in rejecting growing authoritarianism worldwide and promoting the fight against inequality—is as timely as it is difficult to conceive in a Latin America where significant portions of the left are inspired by the likes of Vladimir Putin, Bashar al-Assad, or Xi Jinping as supposed counterweights to the Empire. Unlike previous gatherings, when the left was ascendant in the region, last July’s meeting of the São Paulo Forum in Havana was marked by speeches that focused on “resistance” and entrenchment. The chosen site—Havana—along with the presence of figures from the most conservative wing of the Cuban government, informed an ideological retreat into an anti-imperialist discourse laden with nostalgia for the late Fidel Castro that left no room for reflective analysis about the experiences—and setbacks—of recent years. Staunch defenses of Nicolás Maduro and Daniel Ortega logically followed. But recovering left ascendance requires stepping outside ideological comfort zones and self-victimization. To paraphrase a French expression regarding its own extreme right, Bolsonaro managed to “undemonize himself.” And should he win the second round, he will be far from alone in the world stage. At the same time, no one in the region, amid its myriad retreats, will be able to challenge him. A victory for the former army captain would be among the biggest democratic setbacks since the military dictatorships of the 1970s, with consequences difficult to fully anticipate. The image of a voter who filmed himself pressing his electronic ballot with the barrel of a gun—obviously in favor of Bolsonaro—was but one postcard of a day that presages nothing good for Brazil or for Latin America. Pablo Stefanoni is editor-in-chief of Nueva Sociedad. He is the co-author, with Martín Baña, of Todo lo que necesitás saber sobre la Revolución rusa (Paidós, 2017). Translated from the Spanish by Laura Peñaranda Currie, Jacquelyn Kovarik, and Laura Weiss.